Finished in 2006 | Rosi G.
Most of you noticed it was my use of DPNS. While I have always been a big follower of the magic loop, these dainty lace mitts were not knitting up slowly on my long circs. The 2-ply lace Still River Mill Yakaboo yarn was just too thin for the magic loop method so I pulled out ye ol’ dpns. The project just FLEW off the needles. 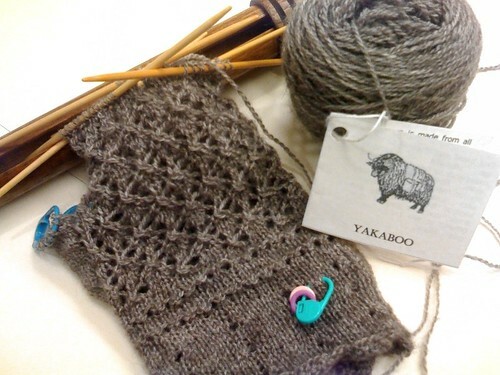 The Yakaboo, purchased at Rhinebeck from the same folks that I got Bison yarn from last year, is a blend of 40% yak, 40% merino and 20% bamboo. These lacey mitts are amazingly warm and soooo soft and comfy. My fave part of this mitt is the finishing along the top of the hand and thumb edges. At first, I’d veered off the pattern and finished it using my own method of basically sewing down the folded over hem and binding off at the same time. That was on the first mitt. When I finished the second mitt, I tried it the way the pattern says (bind off, and THEN sew down the edging) and actually liked that method better. The top doesn’t need to be too stretchy since you don’t want it to be gaping, so the amount of give there is perfect. The edging is the neatest one I’ve knit on a pair of fingerless mitts. 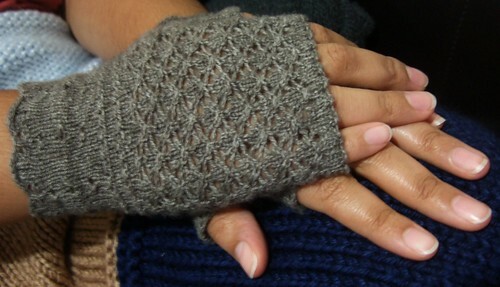 Most mitts have ribbed edgings that curl under at the palm with wear. When this picture was taken, the mitts had already been worn for over a week and the edging looks just like it did when I first finished the mitts. Nice and neat. I would definitely knit these mitts again as gifts or for myself. The project was quick enough, especially once I’d switched to dpns, and easy train knitting. 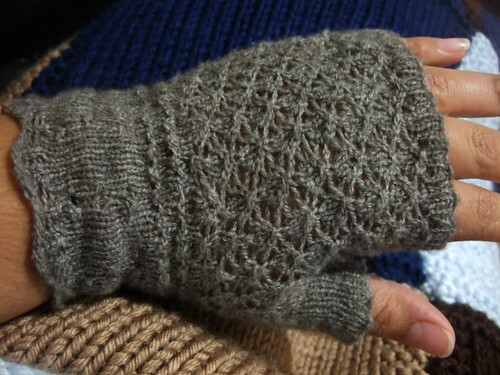 And, even with the all-over lace pattern, the mitts have kept my hands nice and warm in these cold November temps. 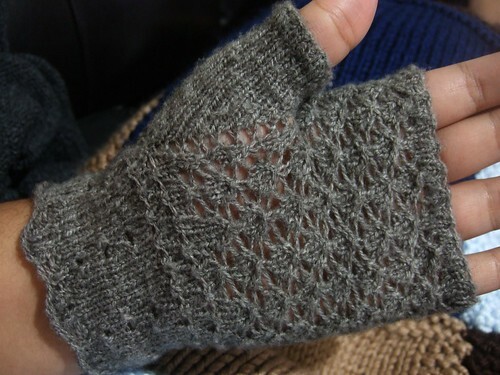 Mods: Picked up 2 extra sts for the thumb and I knit two extra repeats of the lace pattern on the hand to add length. Now, to recap 2006. A year of many tears, smiles, laughter amongst the tears and a blessing to our family amidst all of the pain, Gian Lucius. That little baby has become our sunshine in this house. From the oldest to the youngest, he brightens our days with his smile and I thank God each and every day for having sent him safely to us. Wow! I have more FOs than I thought. 49 total. I know there are 1 or 2 that I didn’t count. To make it an even 50, here’s a DPN case I made this afternoon. Yes, I sew. LOL I wanted a case that held ALL of my dpns and I couldn’t find one commercially. Not even on ebay. Plus I wanted it made out of chinese silk. I used about a half yard of black and 1/4 yard of red. You like? Well, I want to wish everyone a healthy, wonderful, safe, happy, joyous New Year! I hope it’s also FULL of happy knitting time for all of you! Happy 2007 from Chez G.!!! About a month ago, I completed the Perfect Pie Shawl from Weekend Knitting. I loved the pattern!! I knit it with the so-called “mistake” but I like how the loops came out. The mistake in the pattern was that it had you knit the loops thru a different way than normal. Fine by me. Worked out great. I used Schaeffer Anne for the body and Blue Sky Alpacas Alpaca & Silk in plum for the Picot edging. I had almost the ENTIRE skein of Alpaca & Silk leftover so I get to make a nice lacey scarf with that. Ohhh, and check out this motherload of patterns! !